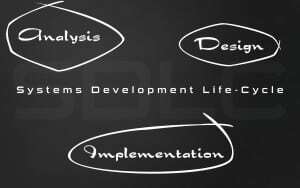 A systems development life cycle is composed of a number of clearly defined and distinct work phases which are used by systems engineers and systems developers to plan for, design, build, test, and deliver information systems. Like anything that is manufactured on an assembly line, an SDLC aims to produce high quality systems that meet or exceed customer expectations, based on customer requirements, by delivering systems which move through each clearly defined phase, within scheduled time-frames and cost estimates. Computer systems are complex and often (especially with the recent rise of service-oriented architecture) link multiple traditional systems potentially supplied by different software vendors. To manage this level of complexity, a number of SDLC models or methodologies have been created, such as “waterfall”; “spiral”; “Agile software development”; “rapid prototyping”; “incremental”; and “synchronize and stabilize”. SDLC can be described along a spectrum of agile to iterative to sequential. Agile methodologies, such as XP and Scrum, focus on lightweight processes which allow for rapid changes (without necessarily following the pattern of SDLC approach) along the development cycle. Iterative methodologies, such as Rational Unified Process and dynamic systems development method, focus on limited project scope and expanding or improving products by multiple iterations. Sequential or big-design-up-front (BDUF) models, such as waterfall, focus on complete and correct planning to guide large projects and risks to successful and predictable results. Other models, such as anamorphic development, tend to focus on a form of development that is guided by project scope and adaptive iterations of feature development. In project management a project can be defined both with a project life cycle (PLC) and an SDLC, during which slightly different activities occur. According to Taylor (2004) “the project life cycle encompasses all the activities of the project, while the systems development life cycle focuses on realizing the product requirements”.